Isn’t this cake beautiful? I love a decorative tin and this one from Prestige is really lovely. The cake looked gorgeous enough without the ganache, but if you’re going to bother with a slice of cake, it should at least be iced or coated in something delicious. 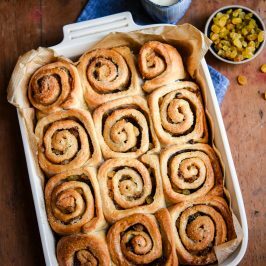 I am a huge fan of beurre noisette or brown butter, not only does it smell absolutely delicious when you’re making it, but it adds a lovely nutty rich flavour to your bakes. There are still so many ways that I want to try and use it, from buttercream to a delicious glaze for doughnuts. This cake is finished off with a delicious Valrhona ganache and a sprinkling of sea salt to balance out all that sweetness. 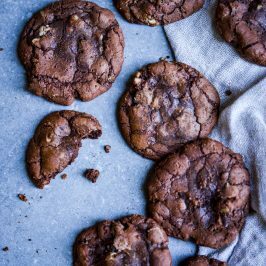 The salt in this recipe really works, but taste the ganache as you go along, you might want to add more, or not bother with the sprinkling on top. Prestige are currently running a competition to coincide with their sponsorship of the new television programme ‘The Secret Chef‘. The premise is that people who are hopeless in the kitchen or just lack the confidence needed to get in the kitchen are helped in secret by a top chef to prepare a meal for their friends and family. The competition over on their Facebook page, gives you the chance to win an amazing set of kitchen ware, just by sharing your kitchen tips and tricks. 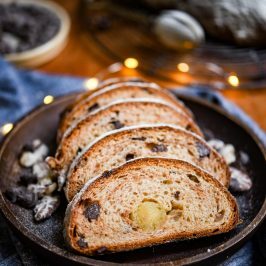 To get you started, I thought I’d share some of the kitchen tips and tricks I’ve learnt over the last few years of writing this blog, some of which are specific to this cake. Don’t have any buttermilk? You can make the following substitute, combine 100ml of milk with 1/2 tbsp lemon juice and leave it for a few minutes. The mixture will separate and give the same effect as buttermilk to your finished cake. Split ganache? Take an immersion or stick blender and use it on a low power to blitz the ganache, this will bring the split ganache back together. If you don’t have an immersion blender, use a whisk, but try not to get too much air into the ganache. Leftover egg whites? Freeze your leftover egg whites in ziplock bags, write on the front how many egg whites there are and the date you froze them. 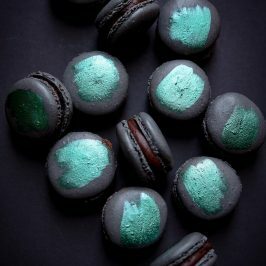 These are great used in meringues, macarons and financiers. Double-up/be leftovers savvy! This doesn’t relate just to patisserie, but I love batch cooking. It makes the working week so much easier. Use your slow cooker to cook double batches of casserole that can be used for pie fillings, to sit underneath mashed potato in a shepherds pie. I also use the slow cooker to make soups for lunches, just cook them overnight, blitz in the morning if you want something a bit smoother, portion it up and either freeze in batches or take to work for lunch in individual portions. Make more pastry than you need for a recipe and leave some in the freezer. Don’t throw away your leftovers, cooked vegetables can be frozen to use at a later date in a bubble and squeak, or for putting in soup. Stale bread can be blitzed into breadcrumbs and kept in the freezer for a treacle tart, or to coat chicken. My final tip…PREPARE! Read the recipe at least twice before you attempt it, make sure you have enough ingredients. 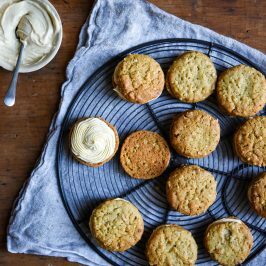 If you’re baking something for an occasion, have double what you need in case something goes wrong with the recipe. Always have the right size tin and have everything to hand before you start. Searching through a drawer with floury hands to find something you need is always so annoying as it gives you extra cleaning to do. 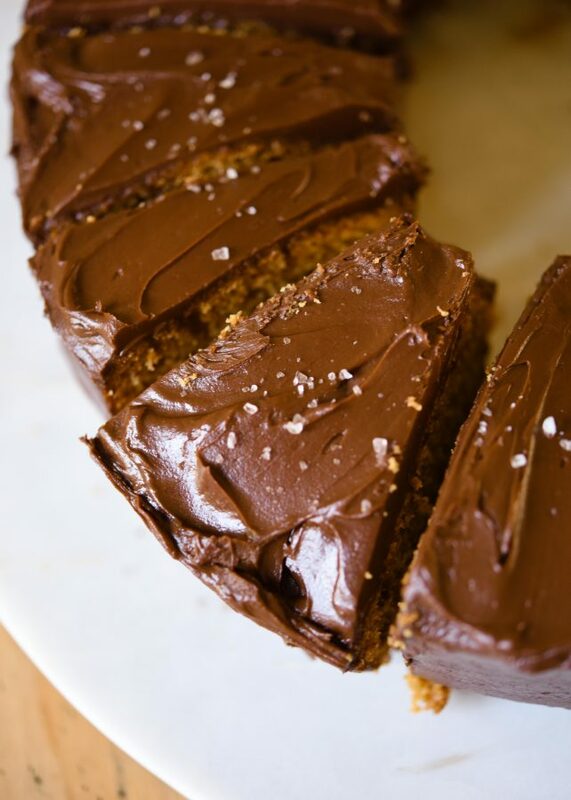 This is a delicious recipe for a coffee and brown butter cake with a sea salt chocolate ganache. It's a great celebration cake, or something to have a nibble with a mug of coffee. First create the beurre noisette, place the butter in a heavy based pan and heat it until it begins to separate and you have small brown deposits and it begins to smell nutty. Place in a heatproof bowl and leave to cool - but do not let it set. Preheat you oven to 150C Fan/170C. Butter and flour your bundt tin, you'll need a 12 Cup or 10"/25cm tin. Place the sugar in a bowl with the eggs and beat until combined, add the cooled beurre noisette and beat again. Add the coffee and buttermilk, and mix, you will have a wet sloppy mix, this is OK. Mix the flour and baking powder together and sift it into the wet mix, stir until fully combined and no bits of flour can be seen. Pour the mix into the prepared tin and bake it in the oven for 55 minutes. Test by sticking a skewer or toothpick into the cake. It should come out clean, if the toothpick has batter on it, cook the cake for another 5 mins and test again. Leave the cake to cool in the tin before turning out on a wire rack. To make the ganache, either chop or break the chocolate into small pieces and place it in a bowl. Take the cream and heat it gently until it comes to a boil, pour this over the chocolate and stir until it's melted. Stir in the teaspoon of salt and the softened butter and leave the ganache to one side to cool. 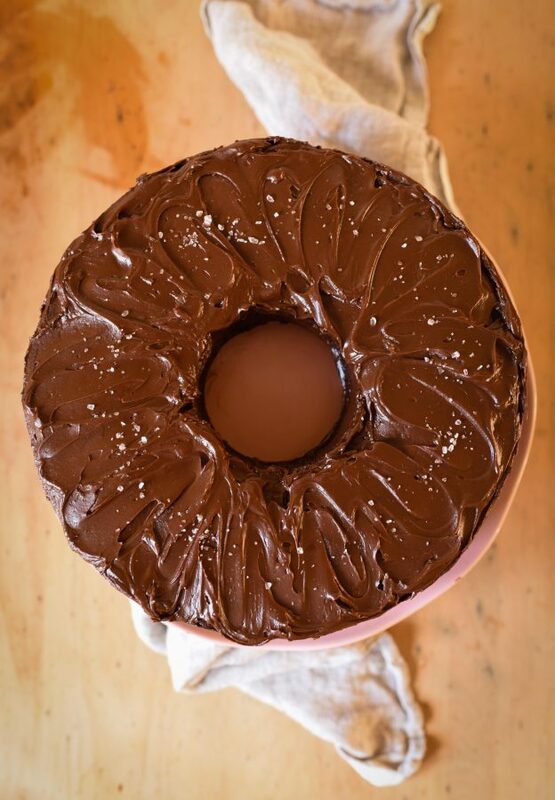 Take the cake, turn it out and then spread the ganache on top using a palette knife. 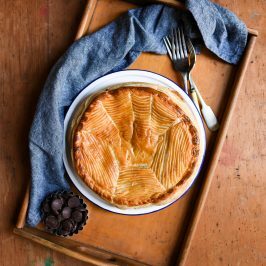 You want it to be a thick fudgey texture rather than a pouring consistency. This cake is really easy to make and it feeds a crowd with extra leftover. Remember to head to the Prestige Facebook page to share your Kitchen Tips and Tricks to enter their brilliant competition. This post was sponsored by Prestige and I was provided with the bundt tin for free. All opinions are my own. Always read the recipe twice, any a time I have found myself without an ingredient, or it all going wrong because of badly written recipe. 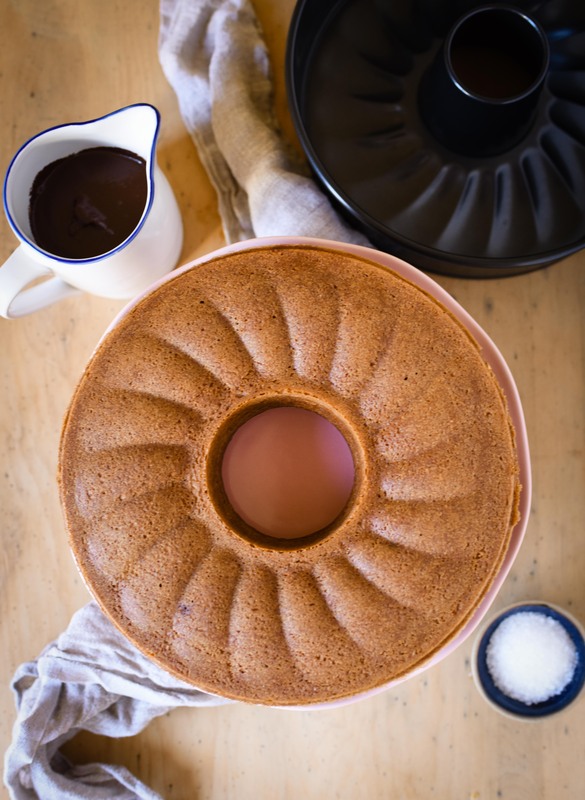 I love this cake – the best flavours for a bundt I’ve seen! Such good advice Helen. I so often screw up a recipe because I mis-read something and I don’t have the ingredient in stock. 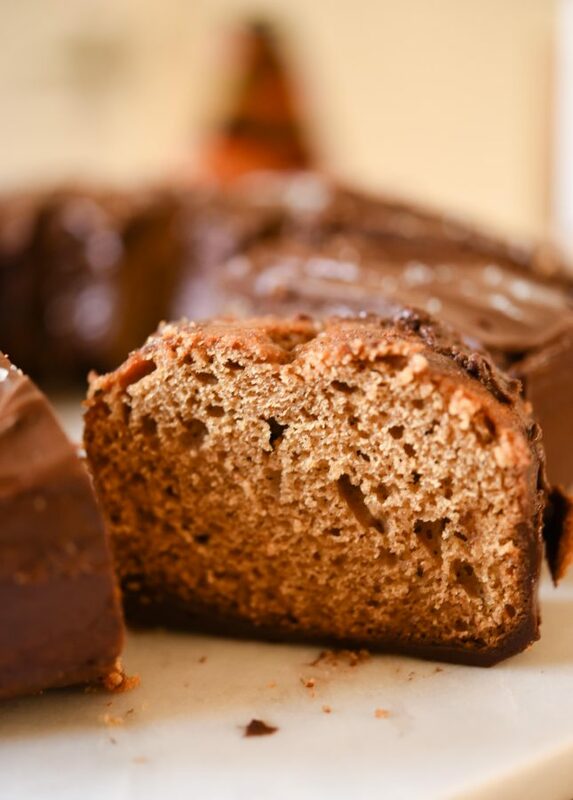 This is a seriously good bundt with grown up flavours. The colour on that cake is perfection and that ganache makes me want to lick my ipad screen. 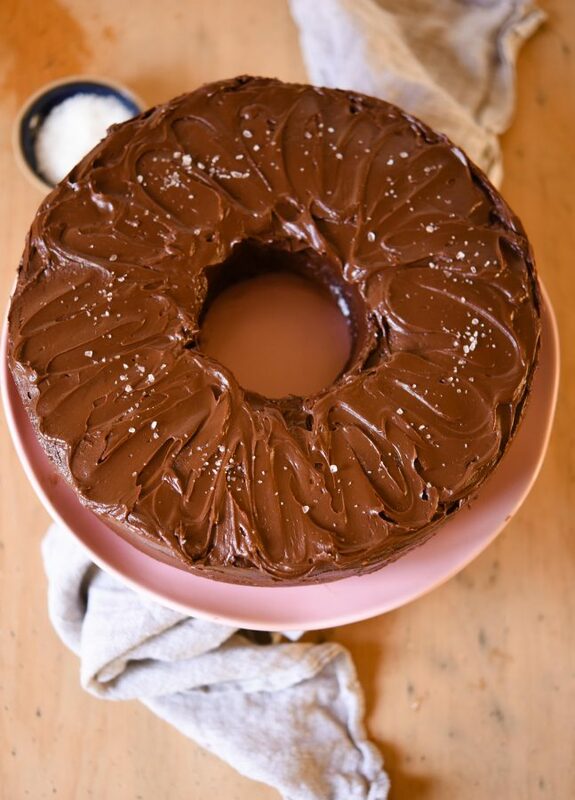 It is such a tasty ganache – I wanted to eat it straight from the bowl! Thank you! Love this cake Angela! It looks gorgeous! What a delicious looking cake! This looks wonderful. Great picture too! That crumb!!! God! I dont want anything with it except a good cup of coffee. This looks amazing! I must make this immediately! I wish I could remember to always follow your last tip! Half the time I’m prepared and half the time I’m running around trying to grab ingredients while the first part is already cooking. I’m with you on brown butter though! I can just imagine what a great flavor it gives to the beautiful cake. Annemarie – I might have shared my tips, but it doesn’t mean I stick to them either. The amount of times I’ve had to clean out the drawers because I need something and my hands are covered in flour! Oh yum! I don’t think that ganache would make it on to the cake, as I would eat it all. 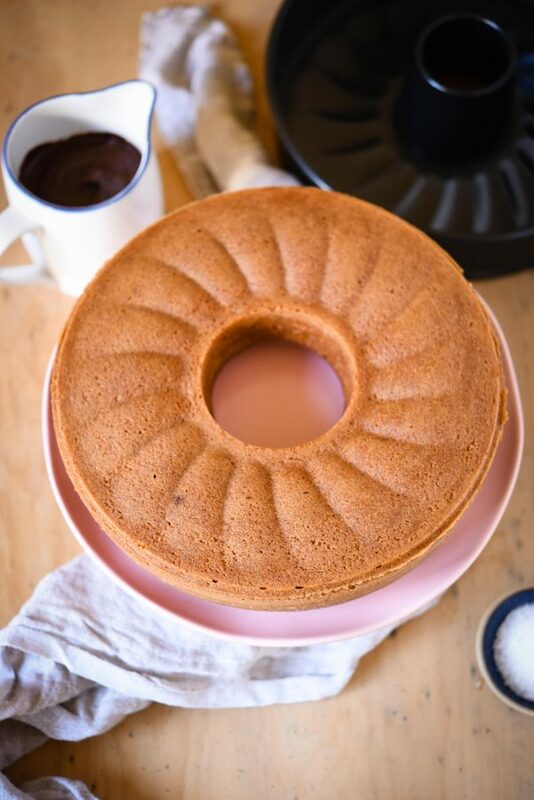 This bundt cake looks so delicious! Great tip about freezing egg whites. I usually just use them up when I don’t need to. I love the chocolate ganache! Can’t wait to try it. 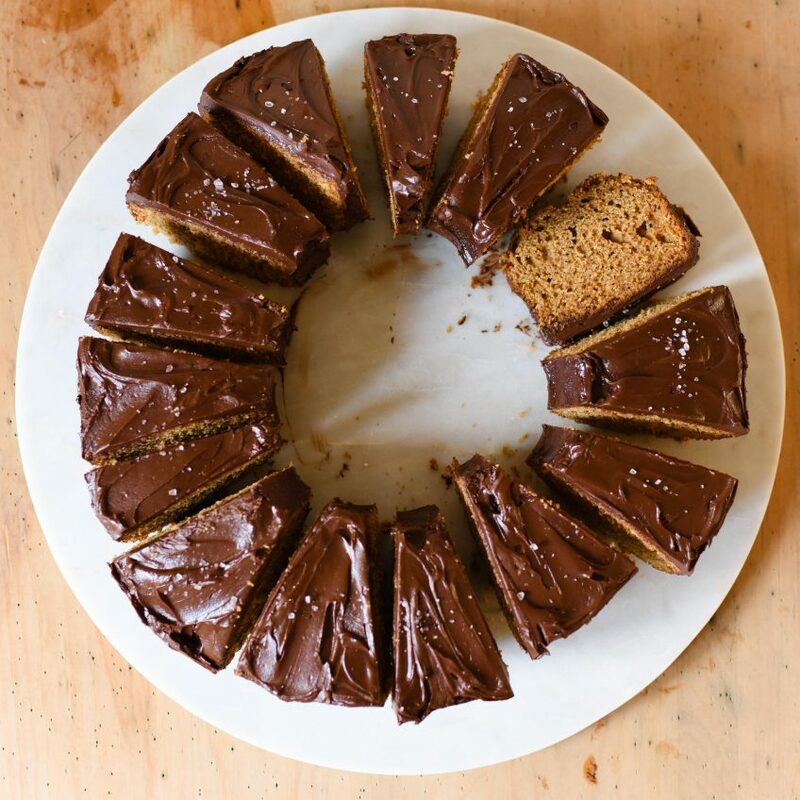 Thanks Elaine – the salted ganache makes this cake feel a bit more grown up! The crumb on the cake and the shine on the chocolate both look fantastic! I’ve never tried beurre noisette in baking before, but you’ve inspired me to give it a go. It’s really delicious Emily and I think it helps give the crumb that gorgeous golden colour. Do try it out.